Newly refurbished Grosvenor Casino Westgate opened its doors this weekend to the biggest £100,000 GUKPT leg in the history of Grosvenor Casinos’ premier poker tour, hosting an extraordinary 308 players. When the dust settled it was local player, Leung Ho Cheung, who left £37,900 richer and with a shiny GUKPT Trophy in tow. Leung qualified for the £500+50 buy-in Main Event for a fraction of the cost all thanks to one of the many satellites on offer held prior to the festival. Even with Cheung’s 35 years playing experience it was no easy task as he found himself up against some tough competitors, with the likes of Grosvenor Casinos’ ambassadors William Kassouf and Andy Hills both making it into the top ten. Cheung was kept on his toes right to the wire as he was up against 25/25 London winner Renee Xie when play reached the heads up stage. Ultimately, Grosvenor Casinos’ wait to crown its first ever female winner continues as Cheung chipped away at Renee’s stack and dealt the final blow as he rivered a flush for the winning hand. Renee was not at all disappointed with her 2nd place finish for £33,000, adding another big score to her ever growing poker resume. When asked what plans Renee has for the money, she said she’d treat herself to a king prawn dinner. After three days of intense poker action, she certainly deserved it. 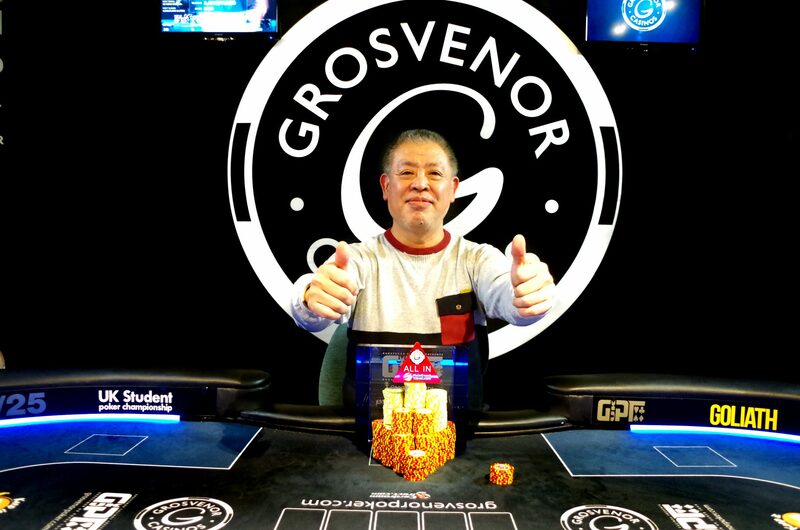 Cheung was not the only table finalist who earnt his seat via a satellite at either Grosvenor Casino Westgate or online on Grosvenorpoker.com. In fact Ken Lockey, David Gee, John Bousfield, James Yeo and Chris Paweson also won their seats via an online satellite, making their prize winnings even more significant! Attention now turns to leg 8 of the 2017 GUKPT, which will be hosted by the wonderful team at Grosvenor Casino Luton. As per GUKPT tradition this also means the guaranteed prizepool doubles up to £200,000 and the Main Event buy-in will be £1,000+100. GUKPT Luton always pulls in some of the biggest names in the game and with it, many qualifiers who take advantage of the extensive satellite offering both at Grosvenor Casino Luton and online on Grosvenorpoker.com. Grosvenor Casinos’ 25/25 Series is also on the move bringing affordable and great structured poker to as many customers as possible. The £25,000 Guaranteed event next stops include Southampton, Swansea, Coventry and Salford.